You get up in the morning and go to gym so you can lose weight while exercising... and then you try to eat as little as possible during the day so that the calories you take in are not more than the calories you burnt at the gym. Does this sum up your relationship with the gym? Swap between high intensity, medium intensity and low intensity exercises in a single session. Your body has to adapt when you change things up - which burns more calories. It also increases your metabolism for hours after you leave the gym. Lifting weights doesn't burn fat necessarily, it builds muscle. But the more muscle you have, the more calories you burn - even long after you've left the gym. It might make you feel real mighty when you gym for two to three hours and outlast the people next to you, but you shouldn't really work out for longer than an hour and 15 minutes per day. 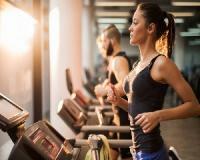 Gyming for longer will only set you up for stress fractures, insomnia and exhaustion. And, when that happens, your gyming goes back to zero, which defeats the purpose. Most exercises involve your core to some extent, but to make doubly sure, squeeze it while exercising. People with stronger cores tend to get full faster because their abs stop the stomach from expanding indefinitely when you eat - it's like getting a nonsurgical gastric bypass! Your body loses steam when it runs out of oxygen. And, because water contains oxygen, sipping on water throughout your workout can help you sustain the intensity you need to maximise your caloric burn. Water also helps the lymphatic system flush fat from the system! Sculpt your summer body now with these gyming tips.